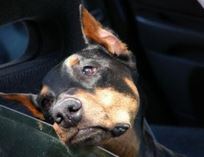 Dog’s car anxiety is common, but always bother the dog owner. If only we have a little more love and patience, we can solve this problem, and make the dogs peaceful and comfortable in the car. To do so, you need to perform the following steps. First, you should let the dog closer to your car, then send to dog to sniff at a car. If the dog wants, encourage him to jump into the car, and allow the dog to explore and play. At this time, you should give the dog praise and encourage in a tender tone such as good dog, to let they know that they do right. Then to give some treats, if your dog like playing but not eating, leave dog toy which dog will play with it. When you observe that dog behaves relaxed and easy, you could close the door. You must continue to observe dog’s reaction, if he shows anxiety for example: stop playing or eating; have an unsettling sound, you need to fall back to the previous step. Repeat until the dog is well-adapted. All being well, you could start up the engine, and gently touch him from head to shoulder, give dog tender encouragement to make him feel comfortable. You could also give treats or toys as before. You can’t drive back and forth until the dog completely adapt to the vibration and sound from the engine. Finally, you could drive for a short distance, then stop, gradually increase the driving distance. Practice each phase step by step. The time required for each phase is uncertain, depends on dog’s ability to adapt the environment. Be patient, some dogs need a few days. If dogs perform well, you should remember to give them praise and treats. Soon your dog will become to like taking the car.